Tube: vote to reject pay deal! On Sunday 23 October European Union leaders hold a summit conference where they will try again to patch up the eurozone economic crisis. Patching up — at the expense of working people across Europe — is about the best they can hope for. The whole laboriously-constructed edifice of the eurozone is in danger of disintegration. The threatened collapse of big banks in 2008, averted by big government interventions, has worked its way through into a crisis of European states’ debts. Travellers at the largest “illegal” encampment in Europe lost their last battle in the courts on 17 October and now face eviction. On Tuesday 18th (as we go to press) Basildon Council confirmed that the eviction will begin on the 19th. Families must now rely on mobilising as many as possible and direct action if they are to resist the bailiffs. The council is evicting 83 families from 49 plots on the site because they are in breach of planning law. The former scrapyard they own and live on does not have permission for residential use. 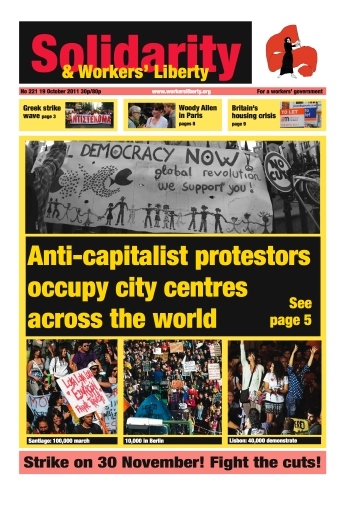 Trade Union Solidarity magazine has been relaunched as an activist resource for rank-and-file trade unionists. The first issue features a survey on bus workers’ struggles, an article on the public sector pensions fight and interviews with activists from various sectors and industries. AWL member Jean Lane is interviewed about being a Unison rep in Tower Hamlets, and hip-hop artist The Ruby Kid (also AWL) is the subject of a cultural feature. There is (hopefully) a major development in our dispute. Word is that Bernard McAulay [Unite national officer for the construction sector] is going to announce the balloting of Balfour Beatty Engineering Services [BBES] sites on Thursday [20 October] at the Unite officers’ meeting in Leeds. Possibly three or maybe give BBES sites will be balloted; we are not sure which ones. Although this would be a very good development, the rank-and-file must not take our eye of the ball or let up in any way. RMT members working for London Underground will vote on a pay deal for 2011-15, in a referendum closing on 27 October. The RMT, along with the three other unions organising LU workers (ASLEF, TSSA and Unite), is recommending acceptance. Unite’s National Education Industry Committee meets on Thursday 20 October to set a timetable for balloting its members in the Higher Education sector for strike action in a dispute about pay. The union, which (along with Unison and GMB) organises non-academic staff in HE, has rejected a management pay offer of a £150 lump-sum for all staff (an average 0.5% increase), which it describes as “derisory”. Taken together with the previous two years’ below-inflation pay deals this would amount to an 11% real-terms pay cut for HE workers since 2008. Over a thousand members of the Rail, Maritime and Transport union who are part of the Principal Civil Service Pension Scheme or the Local Government Pension Scheme will be balloted to join the mass public sector strike action on 30 November. In many ways capital has been global since the 16th century. Four developments are relatively new since the 1980s. In June this year the Communities and Local Government Department reported that 44,160 households were accepted as homeless last year — a rise of 10% on the previous year. In the meantime the Empty Homes Agency estimates that between 500,000 and 725,000 buildings are empty in the UK, enough to house around 1.8 million people.